Police believe at least one of the suspected London bombers died in Thursday's blasts. They said there was forensic evidence that the bomber responsible for the train explosion at Aldgate died there. Personal documents of three suspects were also found close to the explosions suggesting all four died in the blasts. One man has been arrested in Yorkshire and taken to London for questioning after police raids in Leeds and the seizure of a car in Luton. In a press conference police said they had identified four suspects who travelled to London on the morning of the attacks - three of them from West Yorkshire. 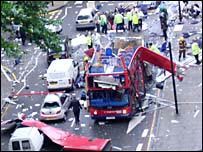 One of the men from West Yorkshire had been reported missing by his family and his property was found at the bus blast scene. The development came after a day of of dramatic developments in the hunt for those behind the bomb attacks in London. 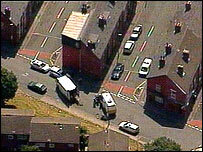 Earlier police carried out controlled explosions in Leeds and Luton and searched six houses. Meanwhile police in Leeds are looking for explosives and have already seized some material. An unoccupied house in the Burley area of Leeds was one of six raided in Leeds after the attacks. Up to 600 people have been evacuated from the area. Police cleared people from homes as well as a mosque, a health centre and an old people's home. Parts of the Beeston area of Leeds has been cordoned off, as well as a street in Dewsbury near the city. Inspector Miles Himsworth said the operation was being led by the Metropolitan Police Anti-Terrorist officers with the support of West Yorkshire Police and the Army Bomb Disposal Unit. 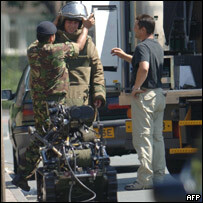 He said officers were searching for explosives and other material at the house where a controlled explosion took place. He said that may include computers, and a "careful and meticulous search" would be carried out. Anti-terrorism officers launched the first raids in the Leeds area on six houses at about 0630 BST. One evacuated resident Nathan Clark, said people were "shocked" at what was happening. "Everyone is amazed that it is happening on their doorstep," he told BBC News. Meanwhile in Luton the railway station has been closed and a cordon placed around an area that also covers the bus station and parts of Luton University campus. Police said a car they believe may be connected to the London bombs has been found in the car park. Earlier the Met commissioner Sir Ian Blair confirmed the operation "is directly connected to the outrages on Thursday". Sir Ian said London, as well as New York, continued to be "major terrorist targets". He said: "Another attack is likely, there's no question about that. When, who knows." The Yorkshire searches were carried out after warrants were issued under the Terrorism Act 2000. BBC security correspondent Frank Gardner said the police were acting on information from searches at the scenes of the crimes in London. Five victims have been formally identified out of 52 people confirmed killed in last Thursday's explosions on three Underground trains and a bus. Several families have received official confirmation of the deaths of loved ones. The police released the names of two further victims on Tuesday - Philip Stuart Russell, 28, of Kennington, south London, and Jamie Gordon, 30. Mr Gordon's family described him in a statement as a "kind, caring person who always put other people first". Two other victims were formally identified on Tuesday, but their families asked for the names not to be released immediately. On Monday, Susan Levy, 53, from Hertfordshire, was the first victim of the bombings to be officially identified by coroners. Meanwhile in London, Prime Minister Tony Blair has signed the official book of condolences for victims at city hall. The Queen has made a "substantial donation" to a fund set up to help the families of people killed and injured in the attacks, it has been announced. Buckingham Palace did not reveal how much had been pledged to the London Bombings Relief Charitable Fund set up on Friday by Mayor Ken Livingstone and the British Red Cross. An anti-terrorist hotline for anyone who might have information for the police has been set up on 0800 789 321.